In the NBA, fans are used to player injuries being clouded by silence and lack of information. Marcus Smart's hand injury goes a bit beyond that. Below is some of the initial information supplied on the mishap. #NEBHInjuryReport: Marcus Smart will not play tonight. He lacerated his hand today on glass and received stitches. The first bit of news indicated a laceration of the hand caused by contact with broken glass. The latest information now indicates that Marcus flew home from Los Angeles with his arm in a sling. This no longer appears to be a simple hand laceration. The sling would indicate involvement of the wrist joint and even the forearm. 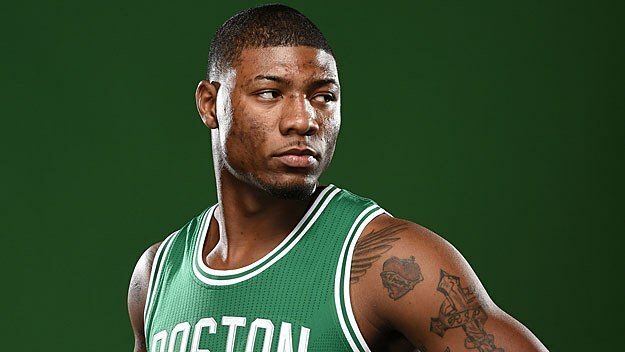 According to a source, while the #Celtics remain out west on their road trip, Marcus Smart is back in Boston. He flew home from LA this evening, with his right arm in a sling. Seemingly he’ll miss the rest of the trip. What I am about to offer from here is pure conjecture on my part, and I admit I may be way off base, but the near-total mystery surrounding the incident leads me to believe I may be correct. In the 103-95 loss to Orlando on January 21st, Smart played only 19 minutes, scored only two points and committed four turnovers in two-and-one-half minutes. In the Celtics 108-107 loss to the Lakers on Tuesday, January 23rd, Marcus missed a three-pointer with nine seconds remaining in the game. Many feel he should not have taken that shot. As a Police Lieutenant and EMT, I have tended to, and treated, many injuries from wall and window punchings. If a window is punched and only the hand gets lacerated, no sling is needed in most cases. If the punch continues far past the window, the forearm can be cut, including even tendons and ligaments. That would likely require a sling. Punching a wall can produce both lacerations and further damage to the hand and wrist joint. That would definitely require a sling. If Marcus' injury did, in fact, require stitches, my hope is that they were only needed for a superficial wound, and not involving muscles, tendons or ligaments. Marcus tends to be an emotional player. In the past I would watch him on the bench after being pulled from the game for miscues. He would often sit next to Al Horford, who I would assume would try to calm him down. It is possible that the Celtics four-game losing streak, Smart's poor game and four turnovers versus Orlando coupled with his ill-advised shot against the Lakers may have precipitated an unfortunate outburst. My hope is that I am wrong and Marcus simply cut his hand while picking up a glass that he dropped at the hotel. But the secrecy and the limited facts available point to something else happening. Here's hoping that the injury is not serious. We just need Marcus back on the court as soon as possible.